TODAY'S FEATURED COMMUNITY SAMPLER IS SPONSOR IS Art Gallery Fabrics and Sharon Holland! Art Gallery Fabrics was started in 2004. Since then creativity, beauty, and design have been their passions, and to this day, they have not changed, bringing a chic and modern perspective to the quilting industry. When it comes to designing a fabric collection we always keep originality and uniqueness on the top of our list. We have the pleasure of working with a talented fabric designers who create enticing color palettes and artful, intricate prints that make our collections one of a kind. Art Gallery designs modern fabrics that keep up with ongoing trends and at the same time it encourages our customers to use new colors and patterns so they venture out of their usual comfort zone. At Art Gallery Fabrics believes strongly in the quality of the fabric and that is transcended in their superior thread count and fine weave. This makes our premium cotton as soft and smooth you can get. You really feel the difference with just one touch! Art Gallery Fabrics is offering this gorgeous ten-piece pink & cream fat quarter bundle with prints from various AGF designers! Be sure to follow Art Gallery Fabrics on all their social platforms. Sharon Holland (that's me) is the author of Utility-Style Quilts for Everyday Living by Sharon Holland (Landauer Publishing 2017). This quilt book is as much a lifestyle book as it is an 80-page, beginner-friendly guide to patchwork. Find easy-to-follow instructions, beautiful photos, fully illustrated step-by-step essential techniques and information to stitch 12 different quilt projects from beginning to end. Each project is fast-pieced and encourages creative changes with skill-building design tips throughout. The lovely patterns are a reason for you to dig into your stash to make quilts you love. This paperback book encompasses traditional and modern quilting for truly timeless everyday use and functional patchwork. You can purchase this book from your local quilt shop, favorite bookstore, online like through Amazon (my affiliate link), or from my Store page. If you order from me you'll have the option to have a signed and/or dedication written in your book by the author (me). For this week's Community Sampler giveaway one lucky winner will receive the Art Gallery Fabrics 10-pc ............ bundle plus a signed copy of the Utility-Style Quilts for Everyday Living book! Giveaway now Closed. Congratulations to Angie Terry! 2. Follow Art Gallery Fabrics on their Blog and/or FACEBOOK. Just let me know that you did by making a separate comment here to record that entry. (Separate comment - second entry). 3. My followers get a third entry! If you follow via subscribing to my posts, through Bloglovin (or other service), or on Instagram, just let me know by making a separate comment here to record that entry. (Separate comment - third entry). Note: I'm no longer on Facebook. 4. Help spread the word!! I know that many of you already do, so I thought it would be nice to add that as another way to enter! Spread the word about the Community Sampler on YOUR instagram, facebook, tweet, pin, blog post, etc... (separate comment - fourth entry). That’s FOUR possible entries! Enter now through Monday, May 14th! The winner will be picked at random around 4pm Eastern. I will post the name of the winner on this post once they've been notified and responded to my email. It's always a big honor when Pat Sloan of American Patchwork and Quilting asks if you want to be on her radio podcast - um, of course, YEESSSS!!!!! I love talking with Pat, she's so knowledgeable about this industry and genuinely a wonderful person. This is my second time on her show--I could talk with her all day long!. Listen to my first live podcast interview on episode #336 which aired April 10, 2017 where Pat and I talk about fabric design and style of quilts. The new episode #373 will air March 19, 2018 sometime after 4 pm Eastern on Patchwork and Quilting Radio. Or on Pat Sloan's website under Radio Shows. Episodes can also be heard at the All People Quilt magazine's website. In new episode #373 interview, Pat and I talk about my Utility-Style Quilts for Everyday Living quilt book for Landauer Publishing and what it means to create a utility-style quilt as well as the behind the scenes makings that went into the book and it's photography. Bobbin quilt from Utility-Style Quilts for Everyday Living quilt book. Photo by Sharon Holland. Goose Chase from Utility-Style Quilts for Everyday Living quilt book. Photo by Sharon Holland. I soon found myself behind the camera shooting the type of life-style photos I wanted depicted in my book. Really, the behind the camera is a happy place for me in my multi-passionate career--I just wish I had a bit more time then was given to meet the 2-week press deadline. I found surprising and creative solutions for capturing the look I wanted for this book and thank goodness for my wonderful friends that let me trash their homes to get that perfect shot! Hear more on that behind the photos on the podcast interview with Pat. Star Crossed from Utility-Style Quilts for Everyday Living quilt book. Photo by Sharon Holland. I like to give each quilt a personality before I even begin and by doing so, it also helped me streamline how the quilt was to be photographed. Star Crossed has a tween-girl storyline for me and was a fun quilt to style. Pat and I talk more about my process behind selecting which fabrics to use in my quilts and how I came up with the different utility quilt looks for my book. When you listen to the podcast interview, I tell Pat my concept behind this book and how I want to encourgage quilters to find their voice and make beautiful quilts that give you permission to use them everyday and love them to pieces. This book is geared toward the beginner but a seasoned quilter will love the quick-make quilt projects and the freedom to explore design. Basically, this book is an excuse to go through your fabric stash and have fun sewing! I had a ton of fun digging into my stash of fabrics for my 12 quilt projects in my book. Many of the fabrics used are vintage gems I've been holding onto for a long time and I'm so happy they are now in quilts that I can use and enjoy rather than the fabrics being stashed away in a closet. See what others are sewing using the patterns in my book by searching the hashtag #UtilityStyleQuiltsforEverydayLiving on Instagram! We're slightly past the halfway mark on this incredible tour for my new book, Utility-Style Quilts for Everyday Living. It fills my heart with joy to see how these talented designer/bloggers have taken my book and ran with creativity in their makes. Many of the bloggers are offering a chance to win a copy of my book from Landauer Publishing so if you want to get your hands on one before Christmas, check out each of their blog posts to see if the giveaway is still open and continue following along on the second part of the tour for even more beautiful makes and giveaway opportunities! I must note that the book giveaways are limited to US address only--sorry international friends. Monday, December 4th was the official start of the tour. My sweet friend, Heidi Staples of Fabric Mutt lead us off. Heidi has a distinctive style to the type of prints she works with (and designs!). Her fabric choices are reminiscent of feedsack prints intermixed with playful graphics and always cheery in colors. They fit Heidi's bubbly personality to a T. For the book blog tour Heidi scaled down my Cabin quilt and made a quilted pillow top that is delightfully fun and beautiful! You must put Fabric Mutt on your blog visit list and find all sorts of exciting projects and tutorials. Tuesday, December 5th we stopped at Amy Friend's blog During Quiet Time and saw how Amy took one block from my Tracery quilt pattern and turn it into a stunning pillow. Both of the first two post in this tour prove you don't have to make a full quilt to make something useful and beautiful for your home (or gifts) as Amy plans to give her pillow make as a Christmas present. The nature inspired prints and soothing palette make this pillow a standout. I do love the Tapestry fabrics prints I designed for Art Gallery Fabrics included in the mix! There's still a few days left on the book giveaway on Amy's blog plus you'll always find wonderful quilting and sewing inspiration on her beautiful site. Wednesday, December 6th belonged to my dear friend and Art Gallery Fabrics designer sister Maureen Cracknell or Maureen Cracknell Handmade. My friendship with Maureen has grown so much this year as we co-hosted the Sewcial Bee Sampler together during the first half of the year. We're kindred spirits and hardly a day goes by now that we aren't texting each other and bouncing ideas off one another. It's amazing to have someone you trust completely and know they have your back. We also have so much fun together--it's a wonder we get any work done at all! Maureen's blog post is another of our collaborations. At Fall Quilt Market in Houston, Maureen debuted her next Art Gallery Fabrics collection called Flower Child. I was at the show to debut my book and had time to sew a quilt for Maureen. Maureen's blog post shows the Goose Chase quilt remake in her new fabrics mixed with AGF Pure Elements and Prisma fabric. The quilt is stunning and just shows how different a design can look simply by switching up the fabrics and colors. I did a wavy, diagonal machine quilting that was easy and forgiving with it's organic quirkiness. Look for more about this quilt when AGF publishes the Lookbook for Maureen's new fabrics. Thursday, December 7th Amber Johnson of Gigi's Thimble wowed us all with her version of the Cabin quilt from my book. This quilt pattern has to be my favorite from the book (shhh, don't tell the other quilts). It is such a simple quilt to make but is so satisfying and a great throw size. The graphic quality of Amber's quilt in the rustic shades of the season look right at home in her farmhouse-style home. I just want to curl up on that sofa and snuggle under her quilt--especially since she used Minky to back her quilt! This was my first opportunity to work with Amber in a blog tour and you must agree we want to see more from her in the future! In the meanwhile, you can visit her blog and see more of what Amber has made. Friday, December 8th the blog tour continued with Karen O'Connor of Lady K Quilts Designs. Karen is not only the nicest person you'll ever meet, she can sign like you wouldn't believe! Be sure to visit her on her to see more of her quilt and get links to her Instagram feed to listen to her Christmas carols. Seriously, that girl needs to make a record album! Okay, back to Karen's quilt make for my book tour...she stitched this stunning remake of the Night and Day quilt from my book and instead of making it queen-size like the pattern called for Karen simply reduced the number of blocks in her quilt and made a size she felt comfortable quilting on her domestic sewing machine. Absolutely stunning and I of course, love all the AGF prints she used in this make. This quilt is as lively and full of energy as Karen is and it was so much fun having her part of this tour! Saturday, December 9th we were treated to this table runner by Kori Turner-Goodhart of Olive Grace Studios. Kori and I go way back but this is the first time we've aligned the stars and moons to work together. It was so much fun seeing what Kori would choose to make from my book and I adore her version of my Viewpoint table runner. Kori used the cheery print Petally Sweet from my Gossamer fabrics for Art Gallery Fabrics as the focal print on the runner. You know I love these colors but what I also love is that this runner fits Kori's sweet, feminine, and graceful style. Her blog or better yet, shop is a must visit to see more of what Kori has to offer in quilt design patterns. Sunday, December 10th I cannot deny it, I wish I'd have made this quilt the way Silvia Sutters of A Stranger View has done! Silvia chose the Cabin quilt and an analogous color palette of cool teal with a tiny hint of coral. Both the quilt pattern and the colors are hands down my favorites and pair those with a stunning photography setting and you've got my heart--forever! Silvia and I "met" via the internet and her wonderful personality and talent shine through in everything she does. I've been lucky to have her and several of my blog tours now and she's a powerhouse of talent. If you're not already following this incredible lady, you must! See more of this beautiful quilt on Silvia's blog post for the tour. Photo and quilt top by Sarah Maxwell of Designs by Sarah J.
Monday, December 11th we had the pleasure of visiting Sarah Maxwell of the Designs by Sarah J blog. Sarah cleverly scaled down the Midsommar quilt pattern from my book to make a baby quilt sized project. She incorporated prints from her own fabric lines along with Alison Glass fabrics to create this gorgeous and graphic top. Sarah is a soon-to-be author with Landauer Publishing and an avid designer and quilter. It was fun having Sarah as part of this tour and she has a giveaway of my book open until December 19th so hurry over and enter to win! Be sure to continue following along as the rest of the tour unfolds amazing remakes, tutorials, and insights into my new book Utility-Style Quilts for Everyday Living. You can purchase this book from my newly set up STORE on this website AND get a signed copy (copies are limited)! Or, you can order through Amazon (affiliate link), purchase directly from Landauer Publishing, or from your local quilt shop to name just a few resources. Yup, that's my quilt in the large photo with the chair on the cover of Quilts and More magazine! 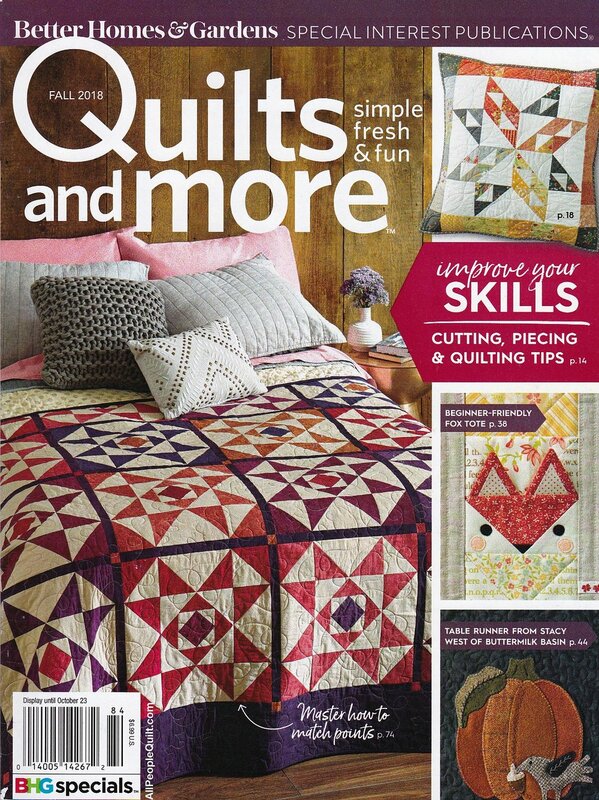 Not only is my quilt on the cover of this issue but I have two quilts in this Quilts and More Winter 2018 magazine. Both of the quilts are made using my Bountiful fabrics for Art Gallery Fabrics and both are super easy to make. The cover quilt is a mix of simple foundation paper-piecing (FPP) and traditional patchwork. I had originally called this quilt Barnstorm because the diagonal FPP sections made me think of barnwood panels. The radiating design has so much energy and makes for a graphic quilt. In the magazine this project has been renamed (editors do that) to: Bursting with Energy. The second quilt in this same issue is also made using Bountiful fabrics with the addition of Art Gallery Fabrics natural linen and Shannon fabrics faux rabbit minky. This projects is technically not a quilt but a throw because it has no batting and is tied instead of quilted. The drape on this piece is absolutely amazing and the faux rabbit makes it so luxurious and a high end designer piece. I made both these quilts for Spring Quilt Market to display in my Bountiful booth. I was thrilled when the All People Quilt editor snatched them up for their publications. It's so hard having to wait to share my makes and it feels like all my work since spring is now coming out at once. This was a purely for fun project and something completely different than I've ever done before. I wanted to showcase my hide print from Bountiful but interject texture and Farmhouse-style into the project. The answer was the faux fur and pompom ties! This project has it all and could actually be one to get the kids involved in. Truth be told, I'm not sure how well this project would launder. But I do suggest using tapestry wool for the pompom as it's very hard wearing and I would launder by hand if needed. But who cares, right? This is such an amazing tactile throw blanket and talk about wow power--you just have to make one! I hope you'll stop by and say hi if you're planning on attending. The All People Quilt booth with have both of my quilts on display so I will snap some pics and show you those on my Market Review post when I get back. Otherwise, be watching my Instagram feed @sharonhollanddesigns for postings while I'm at Market. Looking ahead: Starting November 1st I will be hosting the Bountiful Holiday Blog Tour and have lined up some super talented Makers that will be bringing you fast, fun, and fabulous sewing projects for the holidays, gift giving ideas, and home decor sewing. Plus I will have a Harvest colorway fat quarter bundle giveaway at the end of the tour courtesy of the Fat Quarter Shop. Stop back soon, there's so much more to share with you!